Cam Kim island is one of the most peaceful tourist destinations, but not being known widely. The Cam Kim island discovery tour will give you the opportunity to learn more about the beautiful landscape of the rural areas of Vietnam and the friendliness of the local people. Join Vietnam Travel Group now and you won’t be regret. What is Cam Kim Island? 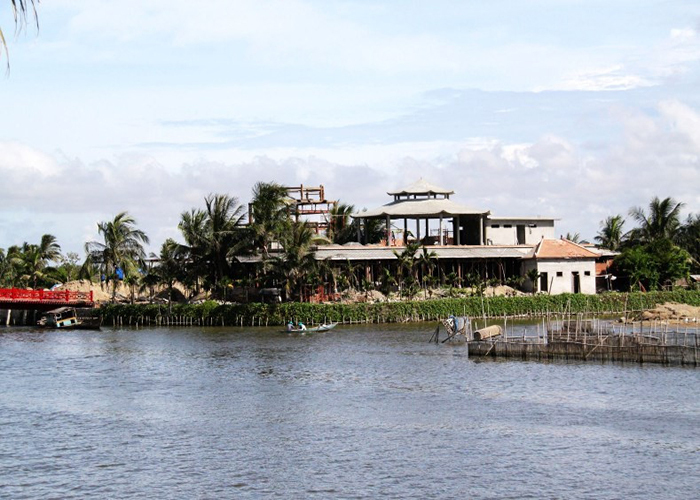 Cam Kim Island is located on the ancient town of Hoi An, Da Nang in Thu Bon river. This is a great attraction for many tourists from both domestic and international. The island also has a farm, providing water-grown vegetables and meals, which all are very fresh, clean and delicious. This is also a well-known place for corn cultivation, consumed throughout the provinces and cities throughout the country, even abroad. People here take advantage of most of the land plots in the garden and outside to grow corn. If visitors come to Cam Kim island on the right occasion of flowering, this is a rare chance. The white flowers intermingled with the green of the corn make an unforgettable impression. The mudflats are located next to the river branches, with small boats anchored. On the shore are the nets, lethargies, spreads, expos ... all create a peaceful and gentle scene in the countryside. Travelers from all over the world especially foreign tourists, when coming to Cam Kim island, also come to traditional villages such as rice paper making, basket weaving, boat repairing... Not only that, but many tourists also spend their precious time studying carpentry and are intoxicated with clattering sounds as well as subtle patterns from the talented hands of the Kim Bong worker. Then, why should you choose Vietnam Travel Group for an adventure in Cam Kim Island? Joining our Cam Kim Island discovery tour, you have the opportunity to learn more about the beautiful landscape of the rural areas of Vietnam and the friendliness of the local people. Besides, you can discover the real Hoi An with Vietnam Cycling Tours. You also can visit local families who live in the area and learn more about their lives. 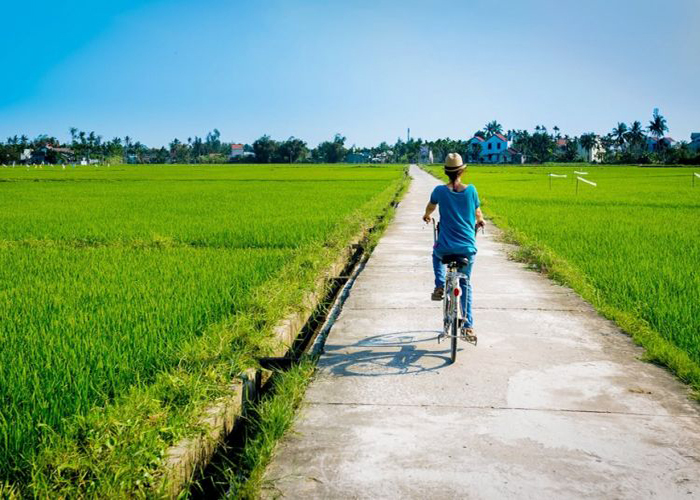 The tour leads you to cycle along the quiet roads amid beautiful scenery, where you can experience and take part in some of the traditional local crafts including making My Quang (local noodle), rice wine (Rượu gạo) and making sleeping mats. And what can be better than enjoy eating locally made noodles with a village family? Why should you cycle in Cam Kim Island? There are several advantages of cycling that you really should consider. The first benefit is health. Cycling is also a way of working out that can help you burn the extra fat as well as improving your strength. Instead of spending hours in the gym, why don’t you go out and cycle for a change? The refreshing atmosphere of the outdoor environment will help you relax and feel much stronger, therefore gives you the will to continue working out and keep fit. The second benefit is relaxation. By cycling in Cam Kim island – where there are numerous beautiful sceneries as well as the refreshing air and nature, you will be able to completely forget the tiredness from daily life and become happier. Cycling is a wonderful activity that improves both your mental and physical health greatly. Instead of staying in a hotel all day and become dull, a little bit of exercise will only do you more good than harm. Cycling is also a great bonding activity. If you are wanting to spend a memorable vacation with your family, your loved ones, your friends or simply your significant other, cycling will be a perfect choice. There is nothing better than spending an entire day with your loved ones and doing some healthy, active and wonderful activities in such a beautiful place. So, we highly recommend you to choose our cycling tour on Cam Kim Island for an exciting holiday. Why don’t you join us right away? What is provided for you in our Cam Kim Island cycling tour? When joining our cycling tour in Cam Kim Island, you will be provided with some certain types of equipment that can help your trip become more interesting and convenient. All of those kinds of stuff are included in the tour price, which is reasonable and affordable, so you don’t have to worry about a single thing. The list of the things you can have in our cycling tour consists of modern support vehicle during a tour. Also, because this is a cycling tour, we give you a high-quality bike as well as a helmet for safety. 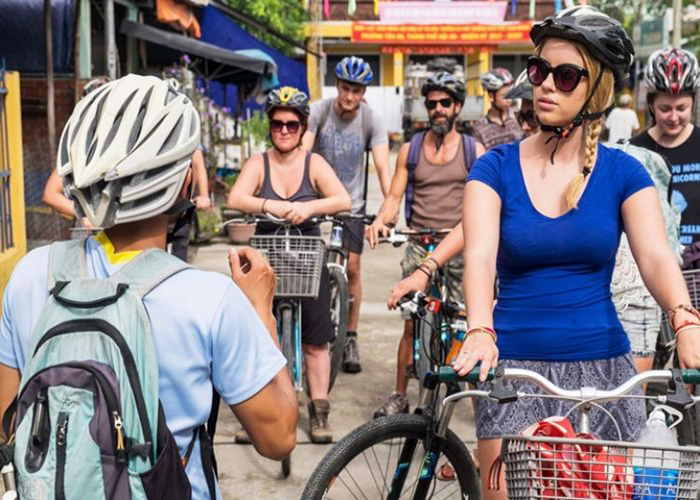 During your cycling day with us, all of your meals as mentioned in the itineraries, which are Vietnamese food and Asian food, will be well prepared and super delicious. This food shall give you a certain perspective about the cuisine of our beautiful S-shaped country. The price of the tour also consists of all entrance fees of the destinations that we will take you to, so the tour can be smooth and quickly for you. Not only that, but you are also being lead and instructed by our friendly English-speaking tour guide. Please note that other languages available depending on availability, and the small surcharge may apply to some languages. Other from those mentioned above, please make sure to visit vietnamtravelgroup.com for more detailed information, such as the child policy – if you are planning to travel with a child, the inclusions as well as exclusions, the refund policy and other things. Vietnam Travel Group also provides many other exciting and wonderful trips in Vietnam if you are looking for one. Book the cycling tour in Cam Kim Island right now! Excited for a cycling day in our beautiful and magnificent Cam Kim Island? Then don’t be hesitate to contact Vietnam Travel Group and book a tour for yourself right away! This amazing adventure will surely not let you down. Vietnam Travel Group is thrilled to be able to serve you in Cam Kim Island, Vietnam. Are you ready to explore with us?